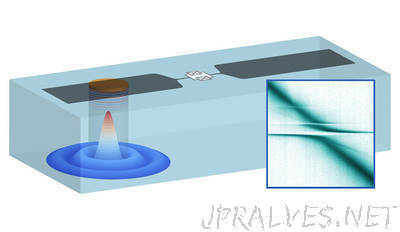 “Yale scientists have created a simple-to-produce device that uses sound waves to store quantum information and convert it from one form to another, all inside a single, integrated chip. The device allows a superconducting artificial atom — a qubit — to exchange energy and quantum information with a high frequency bulk acoustic wave resonator (HBAR). The ability to manipulate and store fragile quantum data in a robust and easy-to-manufacture way is a crucial step in the development of quantum computing technology. The work is a collaboration at Yale between the labs of Robert Schoelkopf, the Sterling Professor of Applied Physics and Physics, and Peter Rakich, assistant professor of physics. Yiwen Chu, a postdoctoral associate in Schoelkopf’s lab, led the effort and is first author of a study that appears Sept. 21 in the online edition of the journal Science. Chu said the new device features a qubit made from superconducting aluminum and a mechanical resonator made with a sapphire wafer. The wafer has two polished surfaces acting as mirrors for sound waves. The combination of these properties enables the researchers to transfer quantum states back and forth between the qubit and the mechanical resonator, Chu added. She also noted that the new device is easier to manufacture than other systems that merge superconducting circuits with mechanical motion. Yale scientists have made a series of quantum superconducting breakthroughs in recent years, directed at creating electronic devices that are the quantum version of the integrated circuit. The ability to combine that knowledge with a mechanical resonator is a valuable step, Chu said. Co-authors of the new study from the Yale Departments of Applied Physics and Physics include Schoelkopf, Rakich, Prashanta Kharel, William Renninger, Luke Burkhart, and Luigi Frunzio.